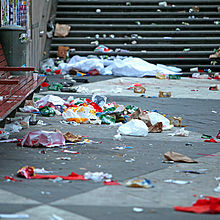 Litter consists of waste products that have been disposed of improperly, without consent, in an inappropriate location. Litter can also be used as a verb. To litter means to throw (often man-made) objects onto the ground and leave them as opposed to disposing of them properly. While most litter is associated with containers, wrappers and paper product; dumped items may include furniture, appliances (white goods), old electronics (e-waste), abandoned vehicles or construction materials. These categories of waste often contain hazardous materials. The distinction between littering and illegal dumping is sometimes defined by volume or the location of the disposed of waste. Illegally dumped items containing hazardous waste can harm the environment and have a potentially negative impact on human health. Larger hazardous items such as tires, appliances, electronics and large industrial containers are often dumped in isolated locations, such as National Forests and other public land. It is a human impact on the environment and is a serious environmental issue in many countries. Litter can exist in the environment for long periods of time before degrading and be transported large distances into the world's oceans. Litter can affect quality of life.